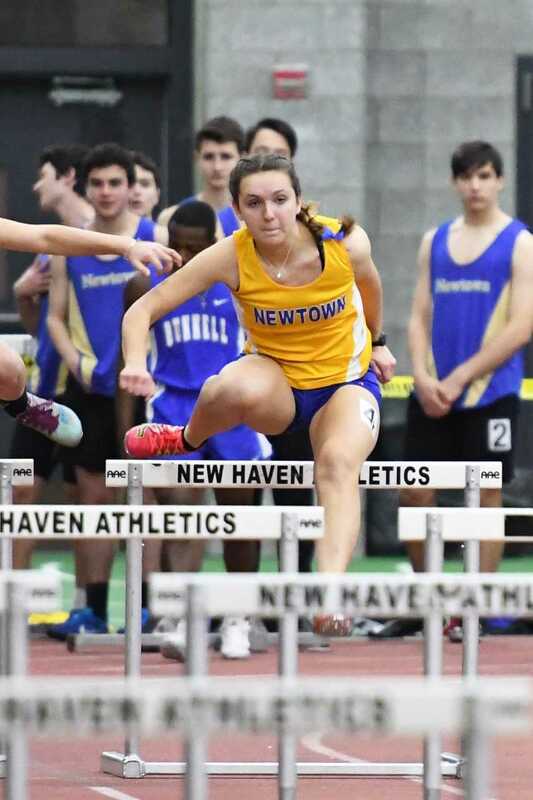 Led by a pair of event wins by sprinter Carly Swierbut, Newtown High School’s girls’ indoor track and field team placed second in the February 2 South-West Conference championship meet, at Floyd Little Athletic Center in New Haven. Swierbut won the 55 meter dash in 7.37 seconds and broke her own SWC meet record in the 300, capturing first in that event with a time of 40.78, nearly three seconds faster than her closest competitor. The NHS girls were runner-up to Weston, which also won the boys’ meet. 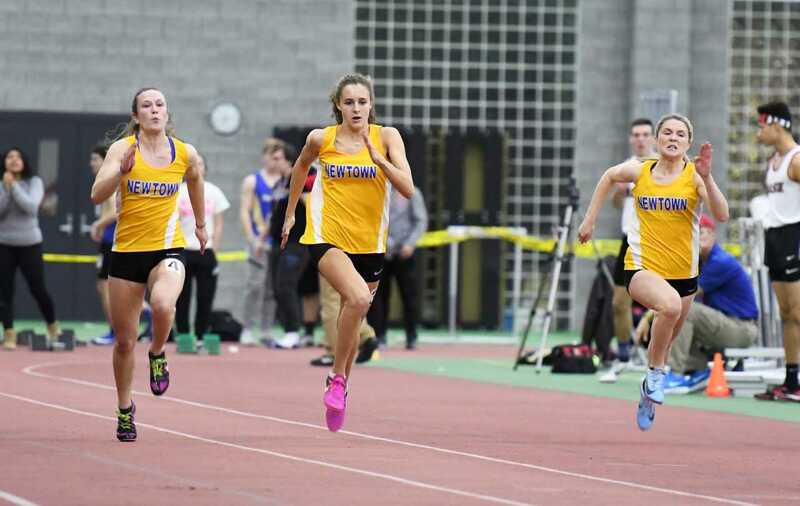 In the girls’ event, Newtown had three finishers among the top four in the 55, as Elise Barricelli and Brianna Lovely came in third and fourth with times of 7.64 and 7.70. Newtown’s 4x200 relay, comprising Lovely, Victoria Moran, Amelia Daly, and Swierbut, was second in 1:50.72. The 4x800 relay of Lu Hage, Emily Tressler, Sophia Guevara, and Ally McCarthy came in third with a time of 10:05.30. In the 55 hurdles, Audrey Benson placed fifth, clocking in at 9.50. McCarthy placed third in the 600 with a time of 1:43.33. Newtown’s 1600 sprint medley relay of Lovely, Moran, Barricelli, and McCarthy was second in 4:30.76. The 4x400 relay of Laura Wong, Maddie Fetchick, Katie Rowan, and Daly was fifth in 4:34.79. Katie Ryan placed second in the pole vault competition, clearing the bar at 9-06. Anna Burns came in fifth in the shot-put competition with a throw of 27-08. 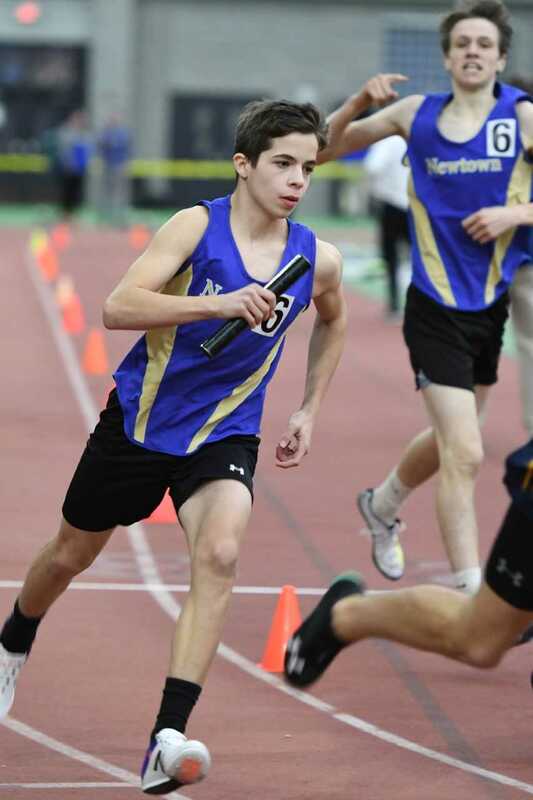 In the boys’ meet, Newtown’s 4x200 of Connor Breslin, Neil Coppola, Zachary Majeski, and William Hornby was fifth in 1:40.47. The 4x800 relay of Justin Halmose, Evan Hildenbrand, Matthew Sortino, and Nick Jacobs was third in 8:56.04. Halmose placed fourth in the 3200, clocking in at 10:20.77. The 4x400 relay, comprising Ben Albee, William Hornby, Jon Nahmias, and Tristan Andrew, was fifth in 3:50.45. Sam Edwards tied for fifth in the pole vault, clearing 11 feet. In the shot-put event, Robert Carroll finished fourth with a throw of 39-01.25.